Hey Ryan, thanks for the reply. I haven’t started looking for a job yet. Due to my current position, I’m not planning on starting that search until the second half of next year or so… I know it can be demotivating to think about how many people are out there learning to code at the moment, but let me offer two thoughts on that which might help. First, the number of jobs are increasing at a faster rate than those becoming qualified to fill them. If you need a little motivation, I urge you to do a little research into the job market projections over the next 5 or 10 years for software developers. That alone should put some wind in your sails! Second, don’t look at the overall numbers of people who sign up for Free Code Camp. The fact that it’s free and easy to sign up for leads to quite a few people who sign up, realize how hard it is, then walk away looking for the next easy thing… Learning to code IS HARD WORK, there is going to be a ton of attrition along the way. In my mind, this is a good thing. It shows, for those of us willing to stick it out, that the accomplishment wasn’t trivial! FCC has been around for, what, over two years now? Looking at their ‘About’ page right now shows front end certs – 3405, data viz – 388 and back end – 252. The number of people who have done all 3 certs are only 135! Listen, if I could give you just one piece of advice, it would be do the work… It’s going to be very difficult at times, but keep your head down and do the work. Everything else will take care of itself. Lean on the FCC community for support and guidance and feel free to contact me at jeremy@crookedcode.com if you think I can be of any help. Best of luck to you. Thanks Dina, best of luck to you with finishing up the Front End Cert! Keep up the good work! 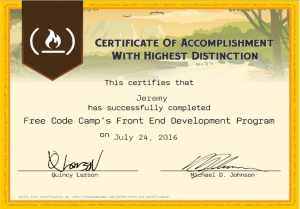 I just registered for Free Code Camp in hopes of pursuing a profession in the software development industry. About to start the front end development program as soon as I purchase a laptop. I noticed we both share a interest in baseball, and just thought I’d leave a reply. Good luck in your further development. Hi,congratulations .I’ve started for a few days and i was wondering how challenges there are?